Figure 1-7. 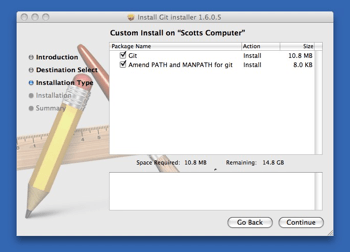 Git OS X installer. Note on Windows usage: you should use Git with the provided msysGit shell (Unix style), it allows to use the complex lines of command given in this book. If you need, for some reason, to use the native Windows shell / command line console, you have to use double quotes instead of simple quotes (for parameters with spaces in them) and you must quote the parameters ending with the circumflex accent (^) if they are last on the line, as it is a continuation symbol in Windows.